Join us for SFCMP in concert for a weekend festival celebrating the great Lou Harrison whose 100th birthday we celebrate in 2017. 1 film, 3 concerts, composers talks, food, friends and great music at the beautiful Z Space. Attend with an All-Weekend Pass for $60, or attend individual events. Concerts are $25 each (or $15 for a group of 4 or more tickets). The Friday night film is $10. Get your tickets now. Dillon Vado is a local drummer and vibraphonist. This concert will feature all original music by Dillon Vado and improvisations from the band. Featuring Dillon Vado on vibraphone, Beth Schenck on alto sax, Greg Sankovich on piano, Alan Hall on drums, and Jeff Denson on bass. Join the convergence for a two day festival in celebration and remembrance of electronic music and design pioneer Don Buchla! Presented by Recombinant Media Labs, Buchla & Associates, Gray Area and Obscura Digital. Natasha Barrett’s work encompasses sound-art, sound-architectural installations, interactive techniques, collaboration with experimental designers and scientists as well live performance and improvisation. She will be in residence at Stanford/CCRMA for several weeks beginning mid-April presenting lectures as part of the Music222 course, public talks, graduate master classes, and presenting a concert of her 3D sound works on Saturday April 22nd with CCRMA’s GRAIL (Giant Radial Array for Immersive Listening) multichannel system, which will be installed in the Braun Rehearsal Hall for the duration of the quarter. Don’t miss this very special event with one of the greatest composers in the spatial music realm! A choral concert with Masterworks Serenade, under the direction of Dr. Bryan Baker. Founded in January 2008 by Dr. Bryan Baker, Serenade is a chamber choir of 26 singers selected by audition primarily among members of Masterworks Chorale. The singers are committed members of the chamber choir, devoting many hours to rehearsal and performance with Serenade. Its varied repertoire, which partially overlaps that of Masterworks Chorale, ranges from classical to contemporary, spirituals and popular pieces. This year’s C4NM Ensemble in Residence, The Living Earth Show, will read and workshop up to six works for guitar and percussion. Composers may submit up to five minutes of music for this opportunity, and will receive 20-30 minutes of time with the ensemble, and a recording of the entire session. The Jacob Szekely Trio with cellist Jacob Szekely. With the Jacob Szekely Trio, Szekely has created a unique musical tapestry that incorporates the richness of jazz improvisation, the structure of classical music and the edginess of rock into its own alchemy which Szekely calls rock chamber jazz. Composer, flutist, bandleader, and educator Nicole Mitchell is a Professor of Music in the Integrated Composition, Improvisation, and Technology program at the University of California, Irvine. She has deep musical roots in Chicago where she served as the first woman president of the Association for the Advancement of Creative Musicians (AACM), and has been a member since 1995. We spoke with her on the eve of the release of her new Black Earth Ensemble album Mandorla Awakening II: Emerging Worlds, the third in a series of albums on Afrofuturism themes. Switzerland’s Intakt label last recorded homegrown jazz piano star Irène Schweizer and South African drums colossus Louis Moholo-Moholo together in 1986, when Swiss banks were helping to prop up South Africa’s apartheid system, and Moholo-Moholo can be heard chanting “free Mandela” in the background. Nearly 30 years later, on the third night of Intakt’s 12-day festival at London’s Vortex, their absorbing story resumed in a different political and musical world. Schweizer’s admiration for Moholo-Moholo and his mutual embrace of her – as both a free-jazz pioneer and a sister who befriended him in the toughest times – glowed as warmly as ever. JOSHUA ABRAMS AND NATURAL INFORMATION SOCIETY at Bridget Donahue (April 23, 7:30 p.m.). At once tensile and hypnotic, “Simultonality,” the new album from Joshua Abrams and Natural Information Society, has an aesthetic of repetition and renewal. Mr. Abrams draws on a global scrapbook of sources: the liquid chime of 20th-century minimalism, the trebly funk of guitar-driven jazz fusion, the burrowing pulse of West Africa’s Gnawa music. At the Bridget Donahue gallery the group will appear in quartet form, with Mr. Abrams on guimbri (a Gnawa stringed bass), Lisa Alvarado on harmonium and percussion, Ben Boye on Wurlitzer and chromatic autoharp, and Mikel Avery on percussion. The concert is part of a continuing series of performances in coordination with the gallery’s exhibition of Ms. Alvarado’s work, which blends textiles, paintings and sound. OLIVER LAKE BIG BAND at the Jazz Gallery (April 21-22, 7:30 and 9:30 p.m.). There’s no mistaking the acerbic sound of Mr. Lake’s alto saxophone; it’s both quizzical and deadly serious. Across five decades, that tone has defined the sound of the World Saxophone Quartet, the all-star combo Trio 3 and a range of Mr. Lake’s own ensembles. With his big band, he offers plush arrangements of his compositions, often undergirded by a trenchant groove. The group includes remarkable young improvisers like the trumpeters Josh Evans and Freddie Hendrix and the saxophonists Jason Marshall and Darius Jones. CHARLES MINGUS 95TH-BIRTHDAY CELEBRATION at Jazz Standard (April 24, 7:30 and 9:30 p.m.). When the era of the jazz big band passed in the 1950s, the bassist Charles Mingus held on to his grand ambitions as a composer. Working with groups of various sizes — usually five to 10 members — he united the influence of Duke Ellington’s marbled orchestral sound with the sharp-elbowed dispatch of bebop. Mingus’s legacy has a home at the Jazz Standard, where the Mingus Big Band performs his music Monday nights. On what would have been his 95th birthday — he died at 56 in 1979 — the band will spend the evening trading off with its sister ensemble, the Mingus Orchestra, and welcome family members and friends to give short talks on his life. S.E.M. ENSEMBLE at Bohemian National Hall (April 25, 7 p.m.). Led by the conductor Petr Kotik, this orchestra champions an alternative Western classical canon, drawing heavily on the 20th-century avant-garde and often introducing new works by contemporary composers. Since 1965 the Chicago-based Association for the Advancement of Creative Musicians has played a similar role in redefining the limits of jazz — or Great Black Music, as its members call it. 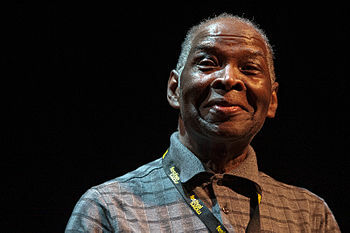 Muhal Richard Abrams, Roscoe Mitchell and George Lewis, all seminal constituents of the A.A.C.M., have worked intermittently with Mr. Kotik in recent years. On Tuesday they will join his orchestra in performing original pieces alongside works by other composers.